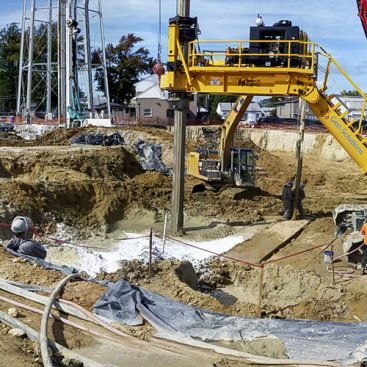 Geo-Solutions completed an In-Situ solidification / stabilization (ISS) project at a Former Manufactured Gas Plant (MGP) located in downtown Milford, Massachusetts. The work included ISS of 10,500 cubic yards of MGP Impacted soil 0-12 feet below ground surface. A custom blend of 6% Portland cement and 8% ground granulated blast furnace slag (GGBFS) was produced on-site at the GSI batch plant. Solidification was performed with a typical Caterpillar 330 hydraulic excavator. Due to the historic structures, boulders and debris present, the operation was completed with two excavators. The first would remove any obstructions and due the initial mixing and the second would complete the mixing of each cell. Cell dimensions were typically 10 foot by 15 foot, with some cells being smaller or irregular shapes to accommodate the horizontal limits of work. 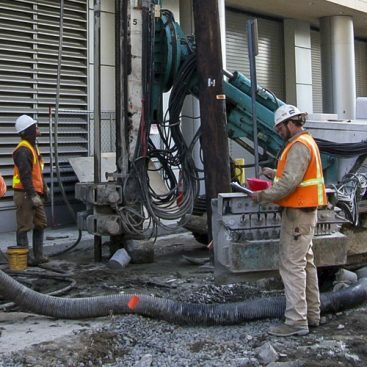 Due to the location of the site in a heavily populated residential and retail area, odor and vapor control were paramount to execution of a successful project. 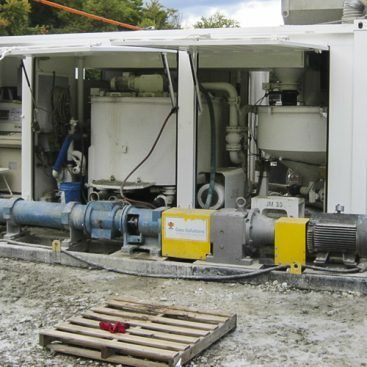 Geo-Solutions utilized Rusmar® short and long duration foam to manage odors during mixing and removal of obstructions. Due to the sensitivity of the project, schedule was crucial to ensure that there was minimal impact to the community. The project was successfully completed having met all of the client’s expectations, on schedule. Geo-Solutions was responsible for overall quality control of the stabilization activities which included process controls to ensure accurate reagent blending and reagent addition rates. The horizontal and vertical limits of the ISS work were verified by total station survey during execution of the work. 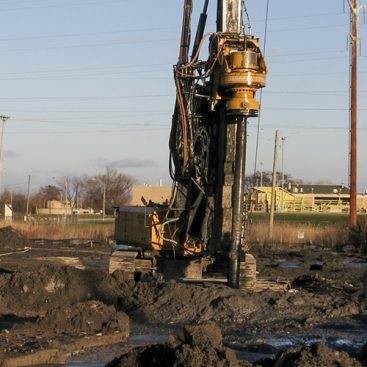 Perform ISS as a basis of site remediation for the Former Milford MGP Site. Meet the performance standards for strength of 50 psi and hydraulic conductivity of 5 x 10-6 cm/s. Complete the project with minimal impact to the local community. 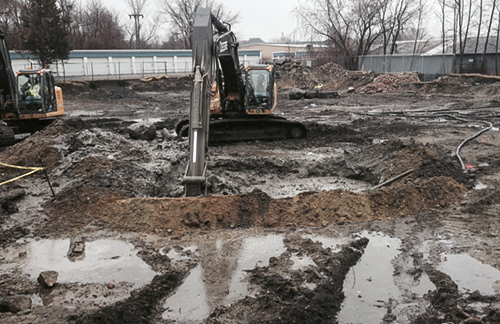 Stabilized approximately 10,500 cubic yards of soil. An on-site blend of Portland cement and GGBFS was utilized as a stabilizing reagent. Worked with Engineer to complete the design and treatability study portion of the project. The frequency of obstructions associated with historic structures and naturally occurring boulders. These impedances were overcome with skilled field personnel that have performed multiple similar MGP and other industrial projects. Sensitivity of the project within the retail/ residential area of downtown Milford. During mobilization and demobilization, local police traffic details were used to mitigate impacts to local traffic. Ingoing and outgoing material deliveries were closing coordinated with Geo-Solutions personnel and odor and vapor control was rigorously applied during the work.